One of Google Maps' greatest flaws is that it's been built by algorithm, not by cartographers. This zoomed-out map of Greater London illustrates the point perfectly. In outer London several large centres of population are named, but within the ring of the North/South Circular only two appear. One is Brixton, and rightly so. And the other is Cazenove. Who the hell, other than Google Maps, has heard of Cazenove? I've been to north London to find out. I had to Google it. Searching on Google Maps suggested that Cazenove is an investment bank based in Moorgate, which was both unhelpful and no longer true. But searching on regular Google eventually revealed that the Cazenove we're looking for is located in northern Hackney. It's not even a proper place, it's a council ward, the smallest of the nineteen electoral districts that make up the borough of Hackney. A mere thirteen thousand people live here, in a triangle of residential streets between Clapton, Stamford Hill and Stoke Newington. Cazenove is by no stretch of the imagination important enough to merit its prime position on Google Maps. But it is a truly diverse corner of the capital, and to those who live here it's very much home. I hoped that by visiting Cazenove I'd discover somewhere of interest to tell you about. I arrived at the ward's only station, which is Stoke Newington, and set off in search of mild excitement. I passed the legendary white goods retailer Sellfridges, except they were across the road in Stoke Newington ward so didn't count. I passed the delights of Stoke Newington Common, except that was across the road in Hackney Downs, ditto. Instead I headed north and walked around my target area for an hour, confirming that Cazenove is basically a lot of streets where people live. Admittedly they are some rather attractive streets. 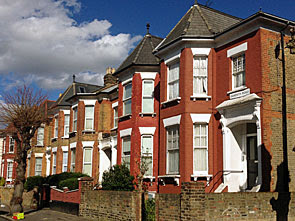 A large proportion of the ward has conservation area status, stretched out along the north/south spine of the delightfully named Osbaldeston Road. The local housing stock is built from London stock brick and dates to the late Victorian period. These are high sweeping terraces with painted architectural embellishments, in a style that's almost uniform but with enough variety to provide great character. Estate agents would have no difficulty selling these as larger family homes, indeed the current going price is about three quarters of a million pounds. Gentrification has yet to bite deep, but you could easily imagine the TV family from Outnumbered living around here, with probably the odd organic vegetable box on the doorstep. I wonder if that's why Cazenove ward returns the only Liberal Democrats to Hackney council - a clean sweep here, and not a single Cleggite elsewhere. Visit on a Saturday and one of Cazenove's demographic peculiarities will reveal itself. We're on the borders of Stamford Hill, home to the largest concentration of Haredi Jews in Europe, many of whom can be seen walking to or from the synagogue beneath large flat fur hats. This striking tyre-shaped headgear is called a shtreimel, worn only by men, whereas their wives could pass almost unnoticed in the religious fashion stakes. On some streets hereabouts several homes have house names written in Hebrew, alongside signs on the doors that might say "No Junk Mail Here" but are probably more devotional. Up Oldhill Street a Sabbath-quiet parade of shops includes a Kosher butchers, a Kosher bakers, a Kosher off licence and 'Just Ripe', your local Heimishe Greengrocer. But that's by no means the full story, as a walk along Cazenove Road reveals. This is the street that gives the ward its name, a broad avenue of Victorian townhouses and more modern infill. To walk its half-mile length is to pass through a broad cross-section of communities, from the traditional council blocks at one end (yes, one's called Nelson Mandela House) to the Bosnia & Herzegovina Community Biblioteka at the other. Trendy Stoke Newington intrudes close by at the Made in Hackney Local Food Kitchen, a sustainable organic store offering communal cooking classes and with a tempting pile of locally-sourced food stacked up along its shelves. Meanwhile opposite the synagogue is a large but unobtrusive mosque, whose worshippers spill out and nod in recognition to the Hasidic gentlemen walking past. They get along well in Cazenove. And that's the theme of an exhibition currently taking place at Hackney Museum. Side by Side - Living in Cazenove is running until May in the gallery by the Town Hall, and features numerous artistic projects representing the ward's religious and ethnic diversity. Residents have painted murals, filmed videos, created collages and framed portraits to tell their stories, including Buddhist monks, Kurdish refugees and an entire class of local schoolchildren. Someone's even recreated a room from a squat, circa 1980, a little less ramshackle than reality. 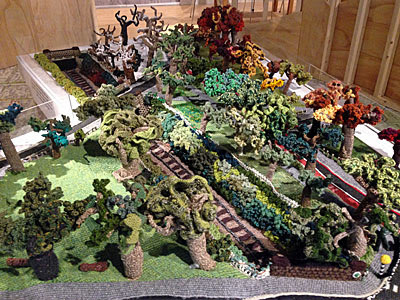 But the highlight is obviously the knitted model of Stoke Newington Common, a triumphant celebration of the four seasons in four-ply, created by the Stoke Newington Common Users Group and the Geffrye Museum's Asian Women's Project. Ask at the front desk and they'll tell you how it was created, or just gawp and admire. It's not the biggest nor the most exciting exhibition you'll ever visit, but it is a fine way for Hackney to celebrate one of its more cohesive communities. And Google Maps may still be utter fools for highlighting Cazenove on their London map, but as a typically atypical corner of the capital, perhaps it merits wider recognition after all.